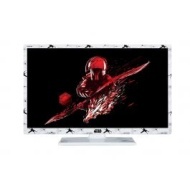 alaTest has collected and analyzed 43 reviews of Toshiba 24SW763DB. The average rating for this product is 4.8/5, compared to an average rating of 4.3/5 for other products in the same category for all reviews. Reviewers really like the size and sound. The usability and image quality are also mentioned favorably. We analyzed user and expert ratings, product age and more factors. Compared to other products in the same category the Toshiba 24SW763DB is awarded an overall alaScore™ of 89/100 = Very good quality. For my boys' small bedroom for gaming. Does everything we need just fine. My son loved it and it had You Tube which was an added bonus. Bought for exercise room, great value, sound a little tinny, so put a cheap sound bar on it and all good now. Richer sound have a variety choice of television to choose from the bottom line to hi-end + 6 years warranty It's cool! It's perfect size for a bedroom. I'm overwhelmed at the quality of the TV for the price. My son absolutely loves the Star Wars opening and closing appearance. Love the white with black pictures. Home screen fab! I bought this a couple of weeks ago for my son, he loves it. The tv is really good value for money, I couldn't find it cheaper anywhere else. Delivery was quick, excellent all round service.